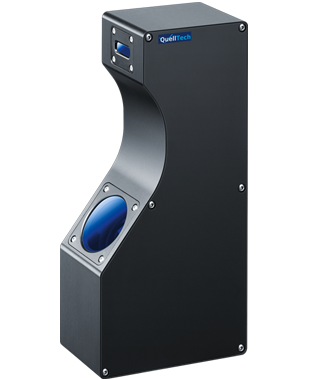 QuellTech laser-scanners make use of the triangulation principle to detect the two-dimensional profile of surfaces. By means of particular optical components, a point-shaped laser beam is expanded to a line and projected to the object of interest. The diffuse light of the reflected laser line is captured by an objective at a certain angle and then directed to a two-dimensional receiver chip. On the basis of distances and angles known, a precise calibrated height value (z) is calculated for each pixel in the x level (laser line), resulting in a precise profile in the x-z plane of the sample. If the scanner is guided over the sample (y axis), a series of profiles is created forming a three-dimensional point cloud in space. This point cloud can be subjected by dimensional control carried out by the software. 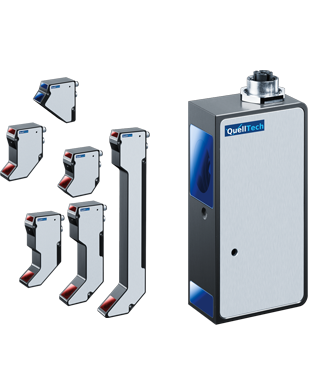 The QuellTech laser scanners perfectly meet all requirements for a large range of measuring applications, allowing flexible integration even into difficult environment. A particular benefit, compared to other laser scanner products, is their high stability against interaction with extraneous light. Different optical power classes are available from 1 to 1400 mW. For optimum adaptation to the surfaces to be examined, the power class and wave length can be selected.